Clinical studies show natural ivy extract, as found in Bronchial Soothe, is more effective in supporting lung and bronchial health as compared to products made solely with synthetic chemicals. 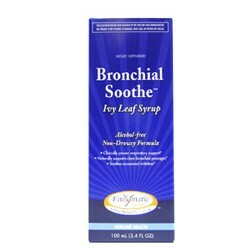 Breathe Easy with Doctor-Recommended Bronchial Soothe! Ivy leaf extract is a traditional ingredient that has been used for centuries to support bronchial health. The exclusive ivy extract in Bronchial Soothe provides natural support for optimal lung and bronchial passageway health. 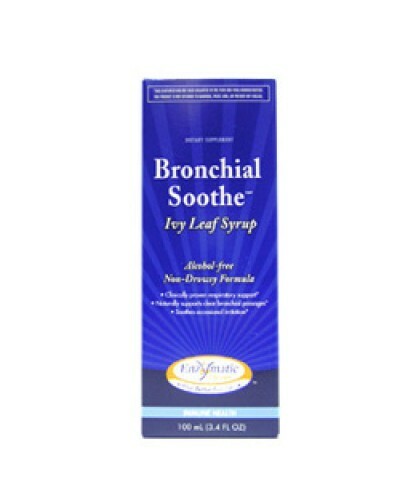 Unlike alcohol-based syrups, the natural ingredients in Bronchial Soothe provide greater levels of safety. Multiple clinical studies prove that Bronchial Soothe is safe for the entire family! Other Ingredients: Purified water, vegetable glycerol, fructose, natural flavors, sucrose laurate, potassium sorbate (to protect flavor), and citric acid. This product contains natural ingredients; color variations are normal.